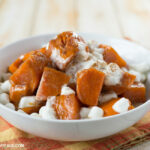 One of my favorite holiday side dish recipes is candied sweet potatoes. Use your Instant Pot to get those holiday side dish recipes, like Instant Pot Candied Sweet Potatoes on the table in minutes! 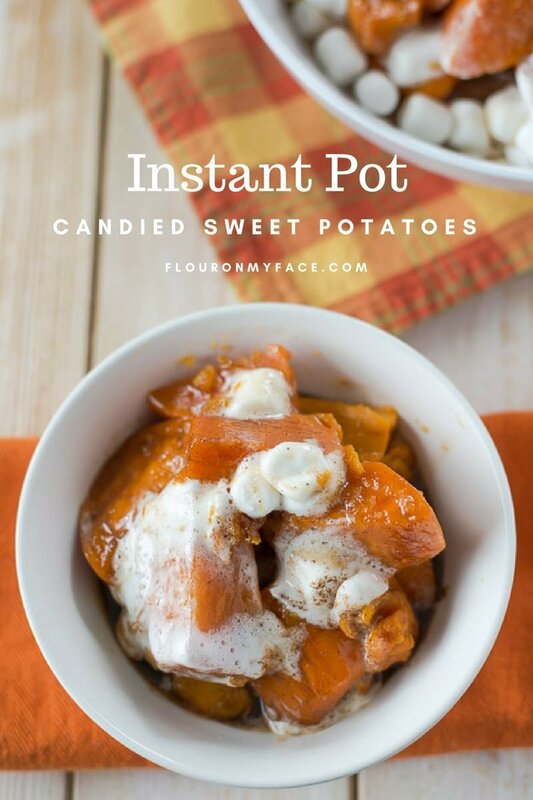 Now that I have an Instant Pot I couldn’t wait to see how fast I could make Instant Pot Candied Sweet Potatoes. Can you guess how fast you can make candied sweet potatoes in an Instant Pot or pressure cooker? 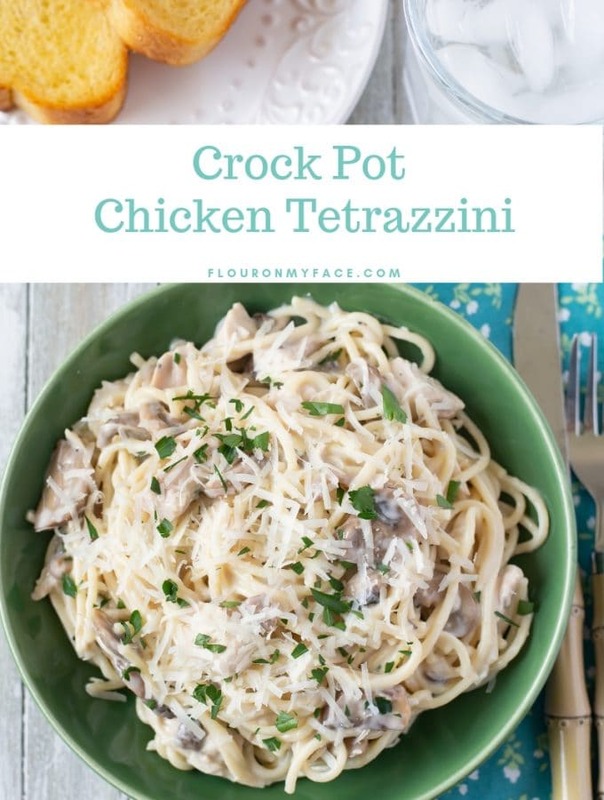 I am amazed at how much I love Instant Pot recipes. Can you believe it is almost Thanksgiving? Before you know it Christmas will be here. 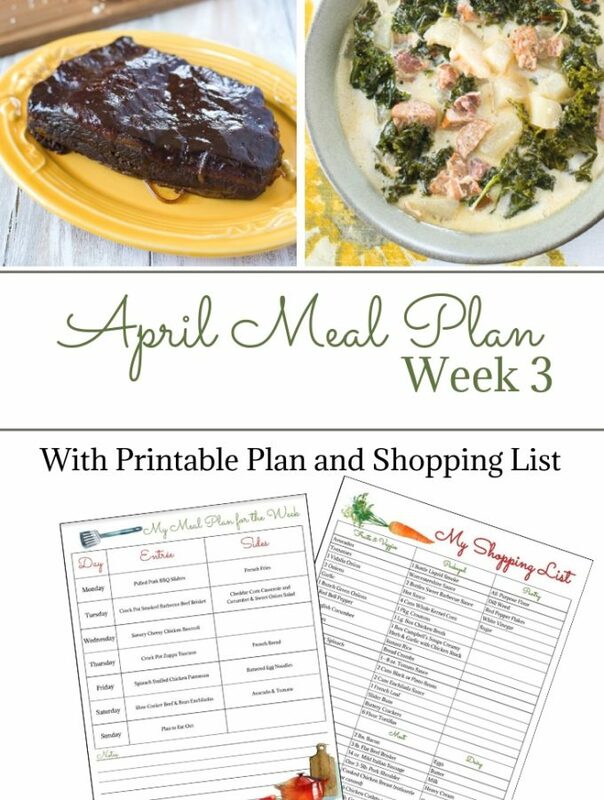 Have you started planning your holiday menu yet? No? Well, what are you waiting for? Every year for our Thanksgiving and Christmas holiday meal I make my favorite candied sweet potatoes recipe. Over the years I have made it the old-fashioned way Southern way and baked fresh sweet potatoes in a casserole dish then topped them off with mini marshmallows. 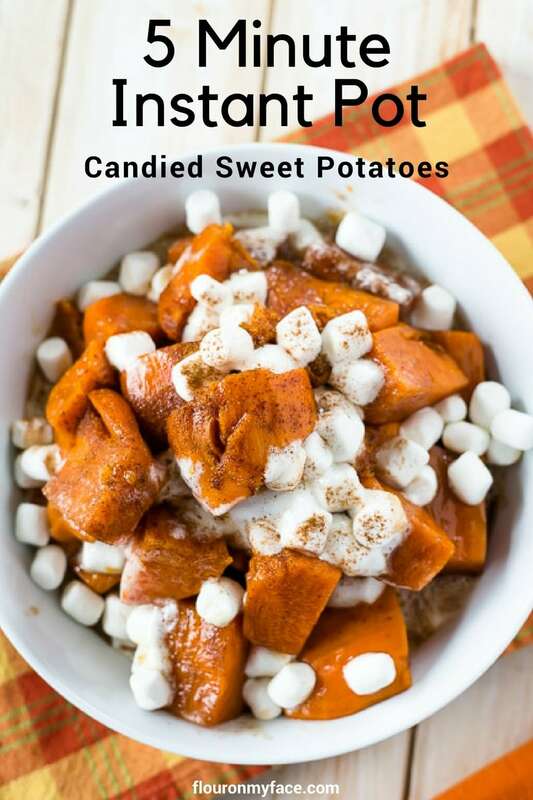 Then when I got smart I started making Crock Pot Candied Sweet Potatoes because it was so much easier to load up the slow cooker and let it do all the work for me with one of my favorite holiday side dish recipes. Now that I bought an (affiliate link) Instant Pot electric pressure cooker I figured hey, I bet it will take mere minutes to turn my favorite holiday side dish recipe into an Instant Pot Candied Sweet Potatoes recipe. Oh yeah! I was right. 5 minutes was all it took to cook raw fresh sweet potatoes (or yams as they are sometimes called). Five minutes and the fresh sweet potatoes were perfectly fork tender after they cooked in the Instant Pot. Wash, peel and cut the sweet potatoes into thick wedges. Soak in a bowl of cool water to prevent browning while you’re getting the candied syrup mixed together. Add the brown sugar, corn syrup, cinnamon, and nutmeg to the melted butter and mix well. Drain the sweet potato wedges in a colander. Remove the basket from the Instant Pot and put the sweet potato wedges into the aluminum pot. Pour the syrup over the sweet potatoes. Put the lid on the Instant Pot and close the lid making sure it has been locked on. Make sure the venting seal is pointed to the closed setting. Press the steam button and set the temperature to normal. Adjust the time to 5 minutes. Once all of the steam has been released from the pressure cooker carefully open the Instant Pot lid carefully making sure the steam is escaping on the opposite side of the pressure cooker away from your face. 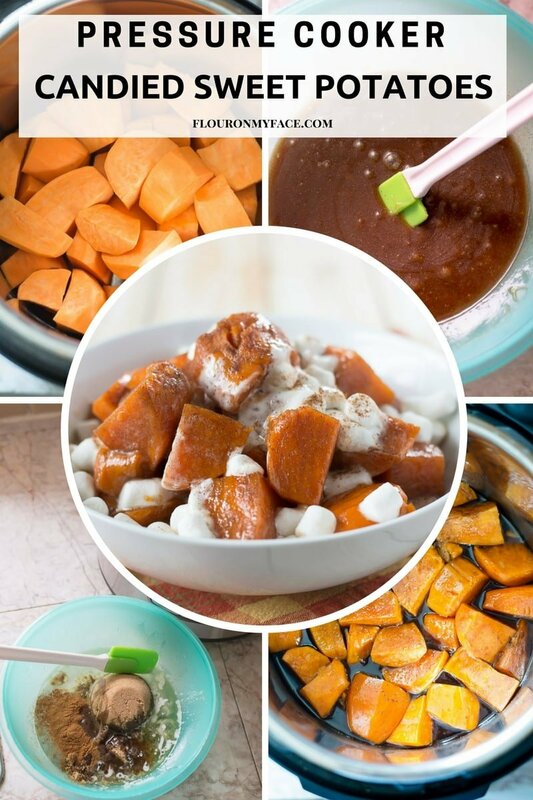 Sprinkle 2 or 3 cups of miniature marshmallows over the top of the cooked candied sweet potatoes. Place the lid back on the pressure cooker but do not turn and lock the lid. Check after about 5 minutes to see if the marshmallows have melted. If not place the lid back on for a few more minutes. If they have melted leave the lid off. You can serve the candied sweet potatoes right from the Instant Pot or you can lift the sweet potatoes out of the Instant Pot with a slotted spoon and place them in a serving bowl to serve. Sprinkle a handful or two of mini marshmallows over the top. One of my favorite holiday side dish recipes is candied sweet potatoes. Now that I have an Instant Pot I couldn’t wait to see how fast I could make Instant Pot Candied Sweet Potatoes. 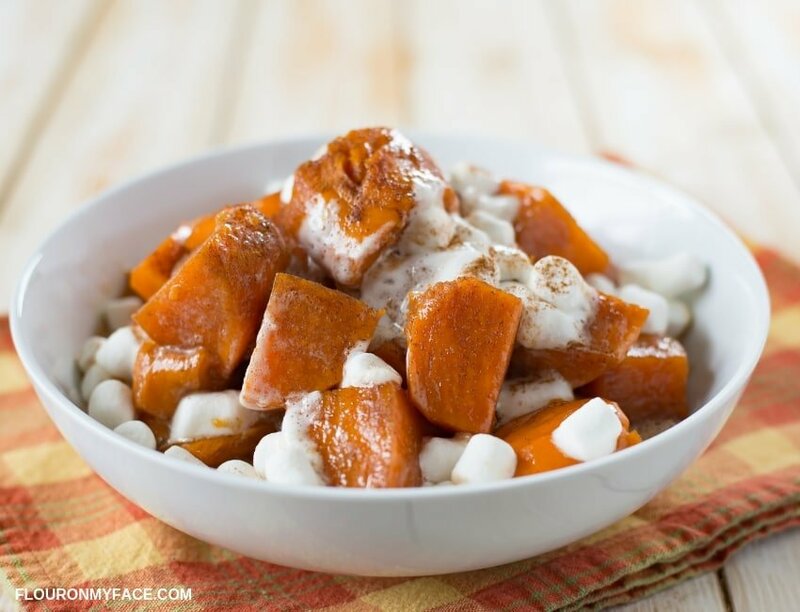 Can you guess how fast you can make candied sweet potatoes in an Instant Pot or pressure cooker? Soak in a bowl of cool water to prevent browning while your getting the candied syrup mixed together. Add the brown sugar, corn syrup, cinnamon and nutmeg to the melted butter and mix well. Once the timer has gone off alerting you that the Instant Pot is done cooking immediately vent the steam using the quick release method. ( carefully use a wooden spoon to tap the valve open making sure the steam is releasing away from your face on the back end of the Instant Pot). Once all of the steam has been quick released from the pressure cooker carefully open the Instant Pot lid carefully making sure the steam is escaping on the opposite side of the pressure cooker away from your face. You can serve the candied sweet potatoes right from the Instant Pot or you can lift the sweet potatoes out of the Instant Pot with a slotted spoon and place them in a serving bowl to serve. Sprinkle a handful or two of mini marshmallows over the top. Got leftover Candied Sweet Potatoes? Make this delicious Sweet Potatoes Bread recipe with your leftover holiday candied sweet potatoes. 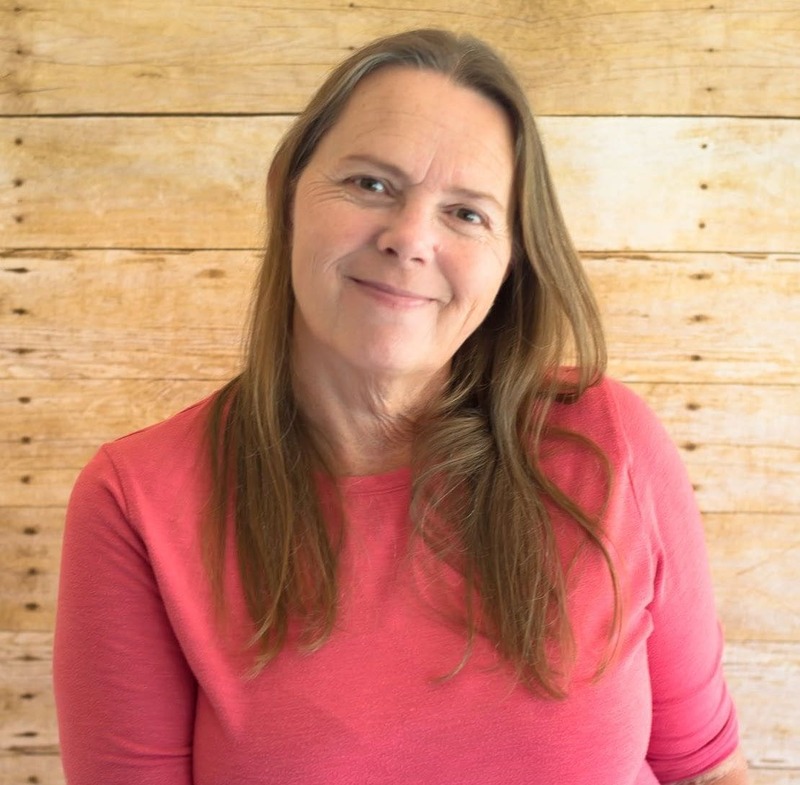 Looking for more Instant Pot Holiday side dish recipes? 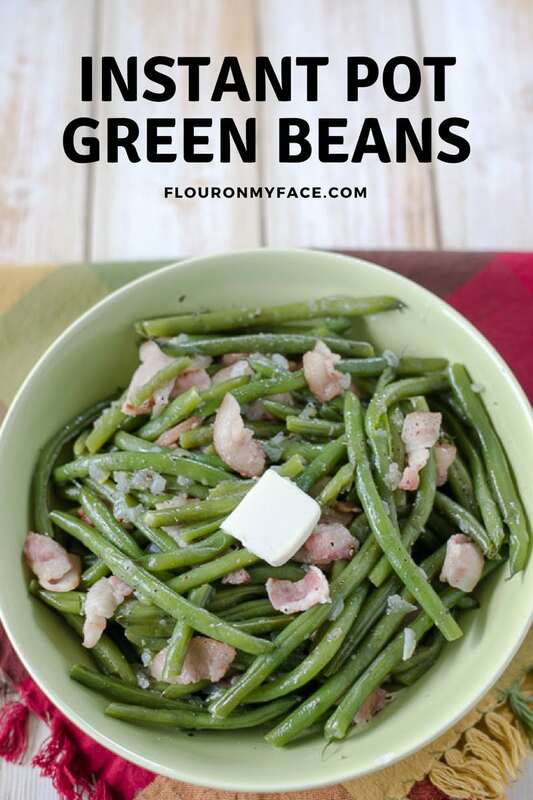 Check out my Instant Pot Green Beans. They are yummy! 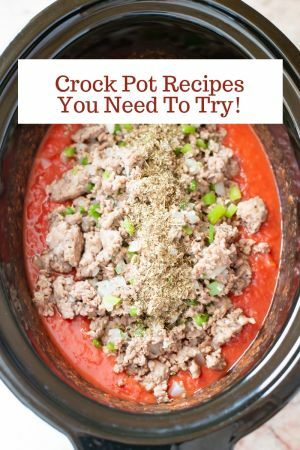 Head over to my Instant Pot recipe page where you will find all of my easy Instant Pot recipes. You could make a very thick simple syrup and substitute it for the corn syrup. To do that you would put 1 1/2 cups of white sugar and 1 1/2 cups of water in a sauce pan. On medium heat stir until most of the sugar is dissolved. Bring the mixture to a boil, reduce the heat to a simmer and cook until thickened. You should have about 1 cup of syrup when your done. If you have more than one cup discard it or use it to sweeten a beverage. What a clever idea! I just got my IP not that long ago, so I’m still getting used to cooking with it, and I wouldn’t have thought of doing sweet potatoes in it. 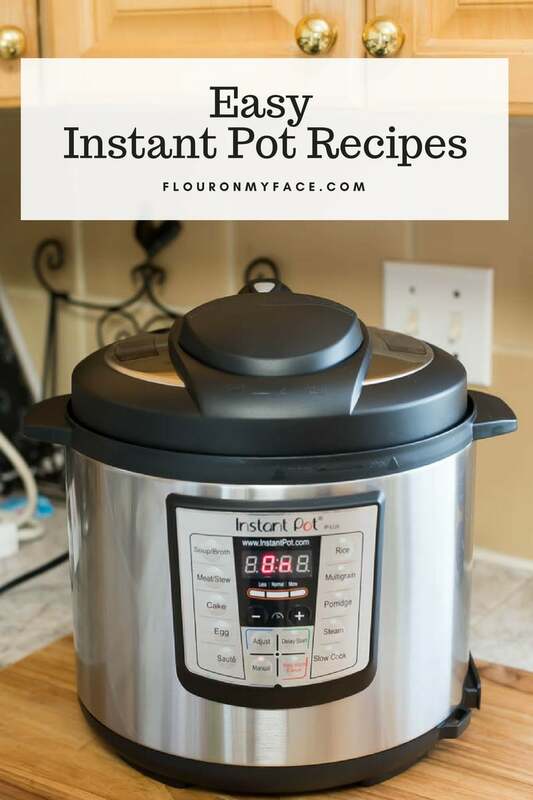 I am having so much fun with my Instant Pot! The sweet potatoes cooked up perfect. Can this be poured into a glass baking dish them broiled real quick to give the marshmallows that baked look? Andrea yes you could pour this into a baking dish to broil the marshmallows to get them toast but I wouldn’t use a glass baking dish. It might shatter from pouring the hot sweet potatoes into a cold glass baking dish. Enjoy! and Happy Thanksgiving. 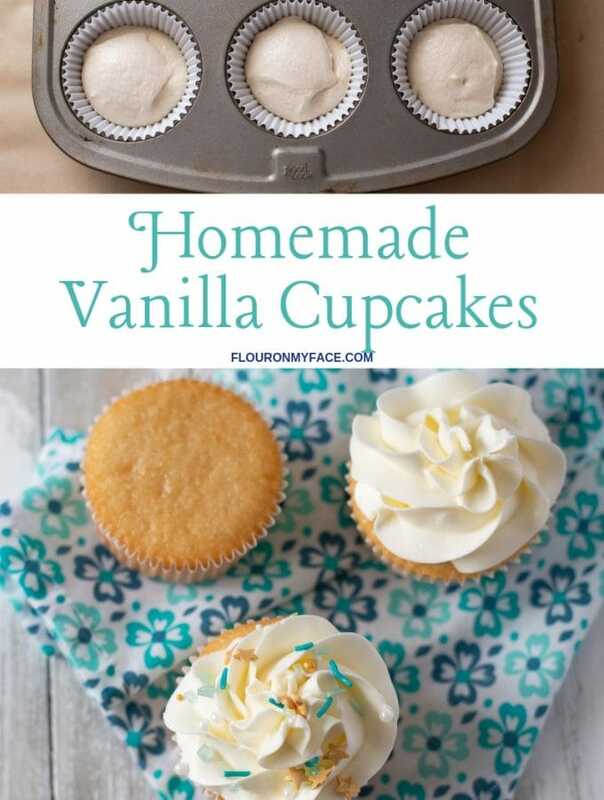 This looks really good and easy. Do you need to add water to the bottom of the IP? Angela I did not add any water to this recipe. 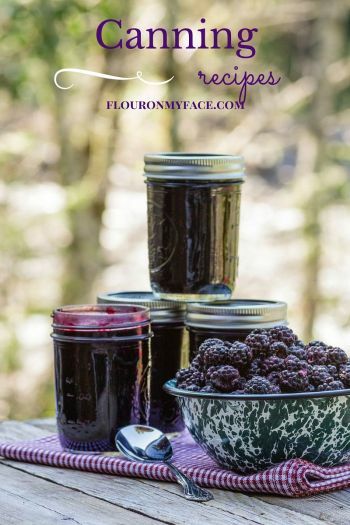 If you are using one of the more sensitive Instant Pots that the burn notice is easily triggered you could add 1/4 cup of water but it is going to cause the syrup to be thin and runny. I would try it without the water first and only add the extra liquid if you do get the burn notice.